Postdoctoral Fellow Matt Trusheim featured in Scientific American! Article: What Are the Limits of Manipulating Nature? Congratulations to Dima, Ren-Jye, Evan, Chuck, Gabriele, Cheng, and our collaborators on the appearance of the graphene bolometer in Nature Nano! This work was done in close collaboration with Dr. KC Fong at BBN. Chris Panuski for the Hertz Fellowship. Kevin Chen for NSF Graduate Fellowship. Uttara Chakraborty for NDSEG and NSF Graduate Fellowships. Ian Christen for the QISE-NET award. Congratulations to Hannah Clevenson — Dr. Hannah Clevenson — for winning the a 2017 Dimitris N. Chorafas Award for excellence in graduate research. Well deserved, Hannah!! 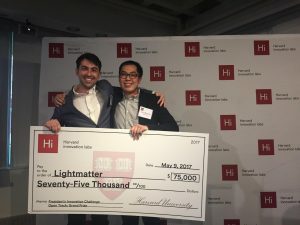 Lightmatter — by Nick Harris, Yichen Shen (Soljacic Group, MIT), Darius Bunandar, and Tom Graham (Harvard) — win Harvard innovation challenge! On August 25-26, Prof Seth Lloyd and Dirk Englund co-organized the “Future Directions of Quantum Information Processing Workshop” in Arlington, VA, as part of a series of workshops sponsored by the Office of Basic Research on emerging areas of science that are a focus of the DoD research portfolio. The final report is now available online: Future Directions of Quantum Information Processing: A Workshop on the Emerging Science and Technology of Quantum Computation, Communication, and Measurement. Link: https://lnkd.in/dP-bEtp Many many thanks to all the workshop participants and to Dr Kate Klemic and Jeremy Zeigler of the Research Corporation. Mihir Pant is selected to give a lightning talk at NetSci 2017 for his collaborative work with Saikat Guha of BBN! Dirk is awarded the OSA’s 2017 Adolph Lomb Medal for pioneering contributions to scalable solid-state quantum memories in nitrogen-vacancy diamond, high-dimensional quantum key distribution, and photonic integrated circuits for quantum! Hannah Clevenson successfully defends her thesis! Edward H. Chen successfully defends his thesis! The groups of Dirk Englund, Pablo Jarillo-Herrero, and Frank Koppens have been awarded a new MISTI program to accelerate collaboration in graphene optoelectronic devices. The groups Prof. Cappellaro, Prof. Englund, and Prof. Wrachtrup are selected for a 2015 MISTI International Collaboration grant to spur collaboration on quantum memories and networks! Luozhou Li successfully defends his thesis! Jake Mower successfully defends his thesis! Congratulations to Sara, Tim, Luozhou, Jordan, Michael, and collaborators to their recent paper in PRX demonstrating a technique for producing photonic integrated circuits with quantum memories! Congratulations to Luozhou, Tim, Ed, Michael, and co-authors for their latest publication in Nature Communications! Jake featured in RLE’s student spotlight! Congratulations to Ren-Jye on his new movie, NanoNerds! Jake wins the Claude E. Shannon Award. Congratulations! Jake Mower receives a 2014 Claude E. Shannon Research Assistantship! Congraulations to Matt, Luozhou, and co-authors on their demonstration of high-quality diamond nanocrystals with record magnetic field resolution! Jonathan and coworkers report long coherence times of NVs in nanofabricated diamond structures – New Journal of Physics 14 (2012). Congrats to Reyu on receiving an NSF Graduate Fellowship! Congrats to Ed and Hannah on receiving NASA Space Technology Research Fellowships (NSTRF)! !